Between 1095 and 1291, Latin Christians heeding the call of the pope launched eight major expeditions and many smaller ones against Muslim armies in an attempt to gain control of and hold Jerusalem. Pope Urban II, in November 1095, in Clermont France, called for a holy war. 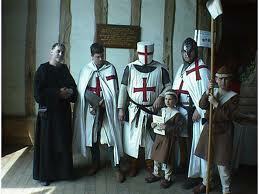 Knights across western Europe prepared to take up the arms and to join the fight to reclaim Jerusalem. The poor and disposesessed became very enthusiastic members of the arm, creating a poor, homeless, undisciplined army. They were called Peter’s People’s Crusade and followed Peter the Hermit. Many of these people starved or were enslaved before they even arrived in Constantinople. What led to the Crusades? Pope Urban offered to “remit all penance for sin for those who went on the Crusade” (Levack 289). Plus, “a penitential pilgrimage to a holy site such as Jerusalem provided a sinner with a pardon for capital crimes such as murder” (Levack 289). But what is the difference between a crusader and a pilgrim! Pope Urban’s announcements muddied important distinctions between the two. (Pilgrims were to be unarmed; Crusaders carried weapons and could attack those he considered heathens). Thus, conquering for Christ was born in groups such as the Templars, the Hospitallers, and the Teutonic Knights. The First Crusade was very successful, but the Muslim army was unusually weak. One reason for this weakness was that the Muslim army was divided internally along theological lines–the Sunni and the Shi’ites. Subsequent Crusades were never as successful. The loss of Edessa, in 1144, led to the launch of the Second Crusade (1147-49). In the West, “northern European crusaders helped the King of Portugal retake Lisbon from the Muslims” (Levack 292). In 1187, “the sultan of Egypt and Syria, Saladin (1137-1193, recaptured Jerusalem for Islam” (Levack 292). Consequences: Most importantly, an increase in trade and economic contacts. the Holy Land was not captured by the Christians in any sustainable way, so this can’t be considered a consequence.